Chicago’s speedy ascent to popularity was fueled by a landmark debut that made an immediate splash with critics and listeners, but it was more than a hit record. Beyond defining the fundamentals of a band’s sound for half a century, it would function as a rock and roll annuity, whose run of success included achievements that were, relative to predictable patterns of commercial behavior at the time, nearly unthinkable. A cover band called the Big Thing when it got together in 1967, the group relocated the following year from the windy city to Los Angeles as it started manufacturing its own originals, and looked to its hometown for a new name when a record deal came along. Chicago‘s lineup of seven musicians from founding through 1974 would prove its most compact roster over more than 50 years. 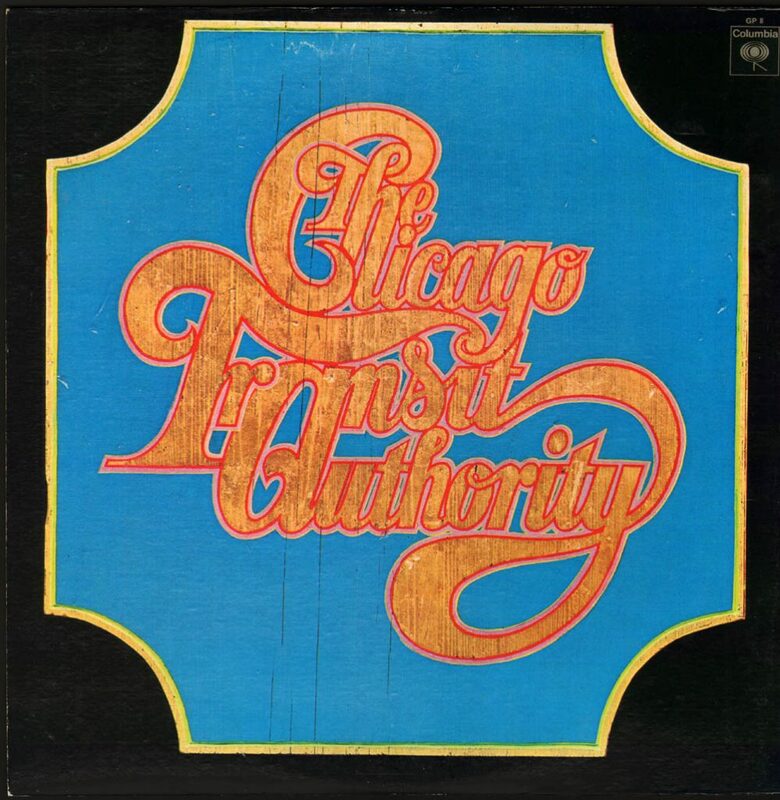 The Chicago Transit Authority (from which “The” is frequently omitted, but it’s right there on the cover) was self-titled when it hit stores in April 1969, but the band soon shortened its name and retroactively erased the collection’s eponymity. That truncation would prove atypical from a band more prone to take the long way around. The debut’s format told the tale: label Columbia originally signed up for two sides, but the band negotiated an expansion, surrendering some royalties in exchange for the right to deliver a double album. Expansiveness would prove a habit—Chicago wouldn’t release a single disc until its fifth album. The band made use of that real estate in exploratory fashion, building interesting diversions alongside its primary calling card of rock meshed with thick doses of horns. The Chicago Transit Authority was a blueprint for the approach. The title of its first cut could not be more apt: “Introduction” is akin to a table of contents, weaving elements from blues and big band sensibilities into the rock milieu. 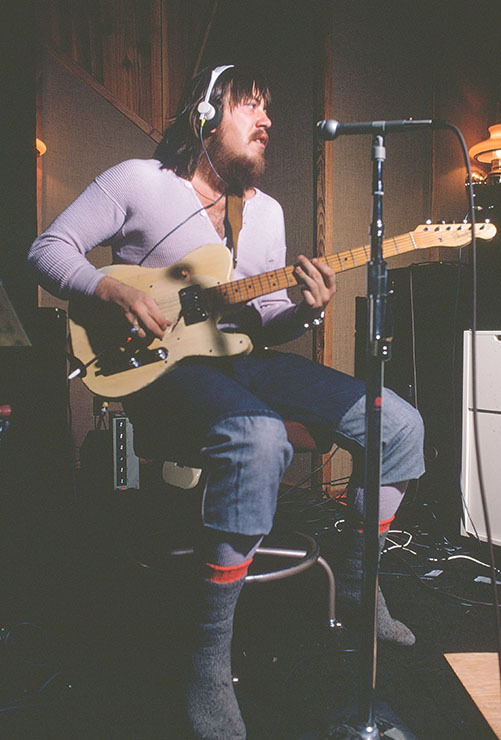 Terry Kath growls the lyrics of his own composition in some places, accelerates the groove with electric guitar sizzle in others. It’s the rest of the arrangement that marks the start-and-stop flow as singular, particularly when James Pankow’s trombone and Lee Loughnane’s trumpet fill out mellow interludes in the 6-½-minute debut. The method is simple but memorable; Kath sets the table and the horns take over, adding shape, definition and punctuation with their omnipresent percolation. Today, The Chicago Transit Authority, produced by James William Guercio and released in late April 1969 on Columbia Records, is justifiably remembered as a hit album with an assortment of popular songs, but at the time of its release that was only half right. The set initially climbed as high as #17 on the Billboard album chart, but did so without the benefit of any hit singles. It was only later, after songs from the group’s second album (including “Make Me Smile,” which became the band’s first Top 10 in 1970) paved the way that songs from the debut record started making their marks on the charts. Among that group is “Does Anybody Really Know What Time it Is?,” which peaked at #7 to become the band’s third straight Top 10 hit (“25 or 6 to 4,” also from the next record, being the second) when it was made a single in October 1970. Composed and led by keyboardist Robert Lamm, the tune’s album version opens with a piano solo that floats coolly and builds urgency, then eases off after about 1:15 before a flourish of horns marks the single’s point of entry. Lamm’s steady, bobbing vocal pace gives the song as much punch as the bright swatches of horns throughout, while response vocals in the chorus provide depth. Lamm’s spoken interlude woven into the final verse is unnecessary clutter in an otherwise engagingly breezy mechanism, but for the most part the song—and overall model for the band—nimbly stitches together its pieces. The collection sprawls over its four sides, embracing the sort of ranginess found in “Poem 58.” Driven by Kath’s decorative electric displays over more than 8:30, its instrumental workout is driven by Danny Seraphine’s drum rattle and given a springy spine by Peter Cetera’s bass line. It’s 5:20 before Lamm’s first vocal arrives, but the blues-laced rock saunter and slink is cohesive and well-designed. On other occasions, the celebration of excess becomes excessive. The set-closing “Liberation” is an ambitious 14 ½ minutes with substantial flavor, much of it driven by Kath’s guitar pyrotechnics. Some of it is showy, some displays uncommon feel, and none is restrained as he lets loose over a period of several minutes, sometimes working against Lamm’s organ traces, other times just working as the rest of the band gets out of the way. At about 11:22 the fever breaks and Kath eases into a mellow cool-down, becoming the song’s lone vocalist shy of the 13-minute mark before a frenetic full-band push stokes a big finish. Kath also is at the center of the album’s most curious artifact, the side three-opening “Free Form Guitar.” His Stratocaster excursion is a sonic search, an experimental diversion, and not a little self-indulgent. Larded with feedback and prolonged sustain, it’s a founding father to dissonant noise rock, skipping right over the punk wave that had not yet arrived with its love of extreme, sonically restless distortion. At its core, it’s just a guy making sounds for nearly seven minutes, and shows that single-focus Chicago is the least interesting Chicago. As a piece of the band’s identity, it scarcely fits, and as a piece of what would become a hit album, it’s certainly among the most-skipped songs ever created. More focused is the crisp “Listen,” a brass-dappled blues rock churn. On an album of tunes that wander through multiple ideas, at a concise 3:22 it’s the most straightforward container in the bunch. Equally direct is the socially conscious “Someday (August 29, 1968),” which follows a prologue of chants by anti-Vietnam War demonstrators at the 1968 Democratic National Convention (in Chicago, for an interesting connection) with a call for change voiced by Lamm and Cetera amid an insistent flurry of horns. “South California Purples” is gritty blues-rock with Lamm at the helm. Sturdy and robust, the number would become a band standard in live settings, supporting long-form workouts. It leads to the side three closer “I’m a Man,” a chipper Spencer Davis Group cover with some lyrical adjustments along the way. “I’m a Man” would later be installed as B-side in 1971 and reach #49 on the Billboard singles chart. 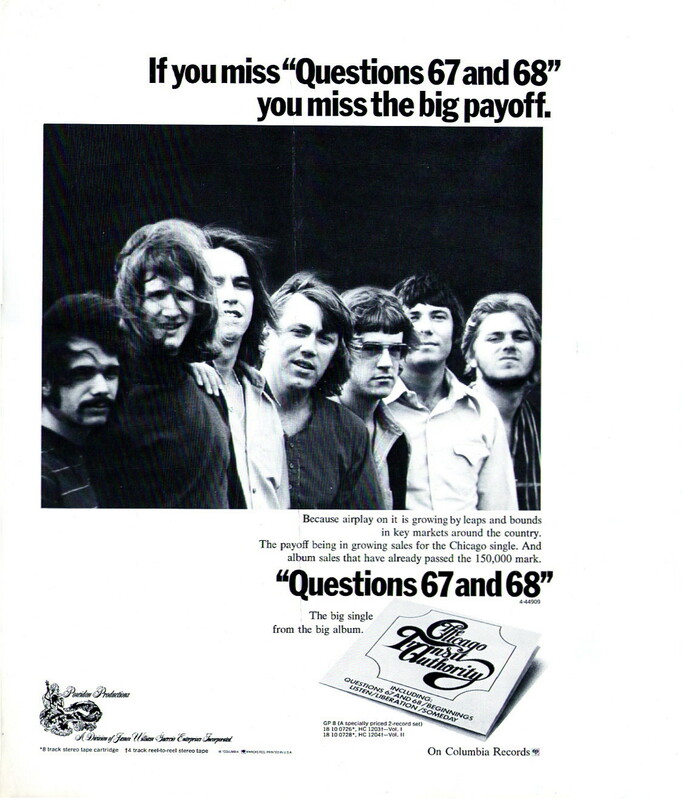 The song it backed was a reissue of “Questions 67 & 68,” which ultimately would reward the band’s faith in it after only reaching number #71 when it was made the group’s first single in July 1969. Sharing lead vocals with Lamm, Cetera ignites his share of the lyrics, his high tone a great vehicle for emphasis. Steady and pulsating with percolating flourishes from multi-tracked trombone, trumpet and Walt Parazaider’s tenor saxophone, the song is a triumph of cadence and shiny sonic appeals. Cetera and Lamm would later record its vocals in Japanese for single release there, and perform it live with those lyrics on a 1972 Japanese tour. Cut down for its September 1971 domestic reissue, the version in the original English climbed as high as #24, and stands as one of the band’s enduring classics. “Beginnings” shared a similar arc of success. The collection’s second single, it failed to chart in a version just under three minutes, only to reach #7 when reissued two years later. A billowing arrangement capped by Lamm’s cool vocal presence and Kath’s rich 12-string acoustic guitar, the song gradually increases in density and power. It stretches out over eight exploratory minutes (with a playout that’s arguably too long by about half) atop Seraphine’s buoyant percussion, with trumpet and trombone sparking its latter portions. As a whole, it is a tribute to the synergies the band enjoyed in its most collaborative moments, forging a rich sonic tapestry that has stood the test of time. 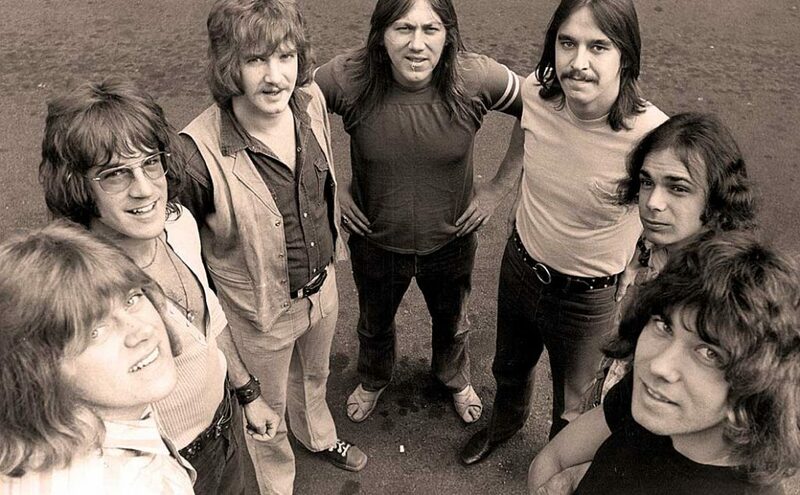 After decent initial success, The Chicago Transit Authority’s real run began once follow-up Chicago (also known as Chicago II) started delivering hit singles. In addition to its eventual success spawning hits, the debut became a perennial seller, starting in 1971 on a chart run that would span a then-record 171 weeks, breaking the old record by nearly four months. It also cemented the group’s identity with listeners, creating an appealing calling card that continues to serve the act half a century on. Well written summary and descriptions of why Chicago has constantly endured over the years. Their songs are not just brilliant and unique rock; but they also touch the hearts of the listeners. Thank you for including the video clips for some readers who may not have heard some these songs and those, like me, who enjoy hearing them again, and again. Already referred to as “Chicago” in the above Questions 67 & 68 print ad – I bought the album when it came out ($4.17 at the local discount store – Clark’s, I think) & have seen the cover dozens of times & never noticed “The” on the logo until just now! 25 or 6 to 4 is a must watch. It’s a warm-up song and it takes a bit to get the band and sound together. Terry Kath plays the hell outta that guitar. It’s something to see. Their music was so monumental that they have Spohn numerous cover bands throughout the world. In my opinion the greatest of these is a multi-country tribute band based in Russia. Fasten your seat belt, you won’t believe your eyes and ears. http://LeonidAndFriends.Band.